We are not the first couple to have this idea. Get a boat, sail off, see the world. At the beginning, we didn’t personally know anyone else that had done it, so it felt like a unique concept. But as we looked for advice and asked around, we soon found the wreckage of those couples that came before us strewn far and wide. We estimate that ninety-nine percent of the sailing couples end up splitting up, with one or both abandoning ship in some dramatic scene. Traveling by boat, especially a small, minimal sailing boat, is extremely demanding in terms of physical and mental effort. We have now experienced a week of full time sailing offshore, a week holed up in Norfolk during a spell of cold rain, and a week motorsailing down the intracoastal waterway, and each travel mode throws your partnership into a new dynamic. Recently, Fabio and I found ourselves run aground, in the dark, on a soft shoal not 20 feet from the slip we were trying to enter. We were exhausted, hungry, cold and stuck. It was dicey. We were off to a rough start that morning (in a rookie move, I lost my camera the night before and had to track it down at 8am), then were delayed by flagging winds throughout the morning. Strong headwinds brought seasickness in the middle of the day, and Fabio sailed on without crew until I recovered in the late afternoon. We enjoyed a quiet sunset together, me still wobbly and him pushing on through fatigue. A few Clif bars stabilized the situation. In a day fraught with perfect opportunities to bicker, we found ourselves in solidarity, even though we were still hours from dinner and safe harbor. Then, all at once, the humidity spiked, fogging our instruments (and my glasses), and the wind decided to visit us at last, tossing our tiny boat into choppy waves toward the small inlet that was our target. We cursed at the sky, and scrambled to prepare for entry. 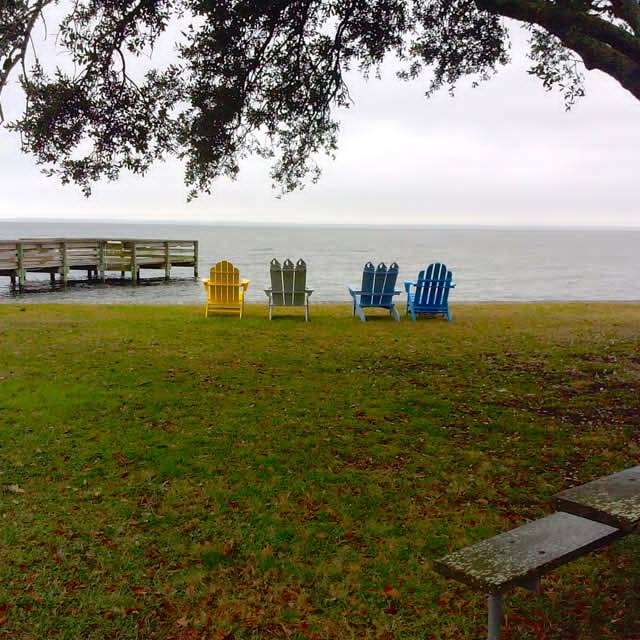 Dreary days in Oriental, North Carolina. Sitting in our stuck boat, with everything soggy, with our head lamps on and empty bellies, I will admit that I took a bit of a tone, and so did he. But then we kept moving. The hours that followed were filled with a complex and slightly dangerous covert maneuver (patent pending) that extracted our sweet little boat off the shoal and tucked her into her slip at last. We did it ourselves, together, with only fleeting thoughts of abandoning ship. 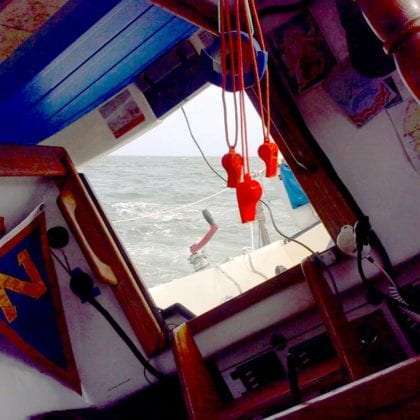 Kate Zidar is our resident blogger on all things living and traveling full-time on a sailboat.